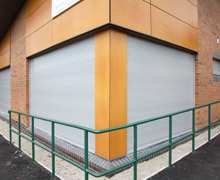 We have a range of security roller shutters suitable for different retail security and shop environments together with a higher security level for commercial, office or industrial roller shutter doors. These can be either solid shutters or punched or perforated slats creating a balance between security and product display. Our roller shutter slats are either of 75mm galvanised steel or a larger 77mm single wall extruded and punched aluminium slat which provides strength whilst delivering 58% vision. All our products are made to measure to your exact requirements and fully installed by our experienced installers. 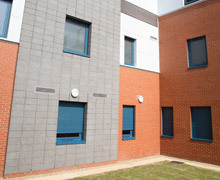 For more information you can download our shutters brochure here. For steel shutters our standard slat colour is galvanised and for our aluminium shutters our standard slat colours are white or brown, however both steel and aluminium can be powder coated in a variety of coloured finishes to match your property or branding. 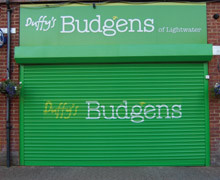 The shutter box can be fitted onto the external face or internally on the reveal. 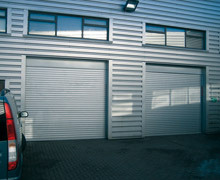 If you are looking for Industrial shutter doors you can find out more by downloading our Industrial shutters brochure here. The roller shutter box can be fitted onto the external face of your window opening or internally on the reveal or built in under the lintel. There are a choice of spring/lock or electric shutter operation methods. Spring Loaded shutters are used for external operation which is useful for exit doors or counters. A lock can be incorporated into the bottom slat if required. Motor & Switch operation are best for larger shutters but can also be used on smaller installations. Motors are fitted inside the shutter axle and operation is usually by rocker switch, key switch or remote control as standard but other controls methods are available. In the event of a power supply failure a manual override can be added to operate from inside. Where desirable a manual override can also be engaged through the outside of an externally fitted shutter box. Under these circumstances a lockable override cover is available. Multi-shutter installations can also be operated from a central or group of switches. Need help? Use our online chat during office hours, leave us a message or call us on 0118 981 7300 to arrange a free site visit to discuss the best security solutions for you.